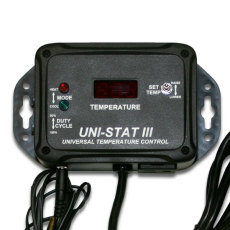 Introducing the Uni-Stat III Temperature Controller! This is a temperature controller made for use with both hot and cold temperature devices. It has the ability to shut off the temperature device when either a high or low set point is reached, and is accurate to within 1Â° of the set temperature! Use this in conjunction with heating pads, heating elements, refrigerators, air conditioners...you name it! It has found popular use for fermentation control and to control cellar temperatures for wine storage. The set temperature can be set anywhere from 35 to 220 F, with a bandwith differential that can be set up to +/- 3 F (factory default is set to 1 F). The Uni-Stat III also has the ability to switch between displaying Fahrenheit or Celcius. The 50% duty cycle setting allows for the unit to cycle on and off every 10 minutes in cool mode (every 5 minutes in heat mode) to avoid excessive cycling and helps to hit target temperatures without overshooting. 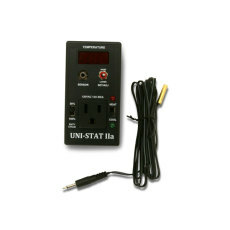 This unit is the big brother of the Unistat IIa and comes with 6 foot power cord and 8 foot temperature sensor probe that can be used with a 1/4 in. thermowell sensor. Operation is a breeze! Simply plug into a wall plug, set the temperature, plug the heating or cooling device into the unit, and set the probe where temperature control is needed. Set to cool or heat, and the device will raise or lower the temperature to the set point. No crazy progamming or insane wiring, just set and forget! This unit also has handy wall mounts that you can use to conveniently mount this close to your device. 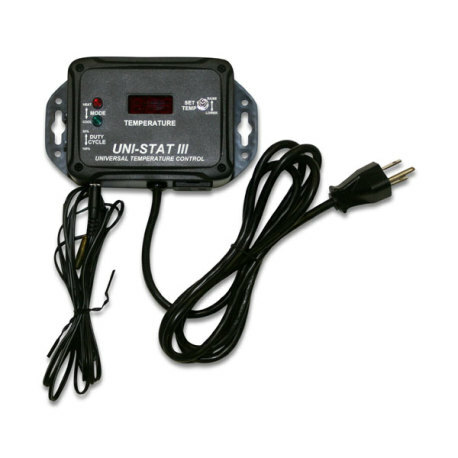 Get a handle on your temperatures using the Uni-Stat III temperature controller! Set the mode switch for either cool or heat mode, then adjust the temperature. That's it! Temperature stays within 1F of set point. 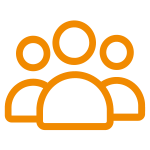 Optional Duty Cycle can be used for optimal performance and energy savings! Compressor protection in cool mode can save the compressor on your refrigerator!